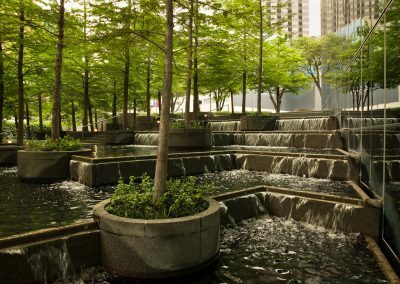 One way to get a dose of “green therapy” during these Arctic-cold days is to view “The Landscape Architecture Legacy of Dan Kiley” at University of Wisconsin-Milwaukee’s School of Architecture and Urban Planning. Besides showcasing places that celebrate nature, the exhibition in the first-floor gallery offers insights into what makes these places timelessly beautiful. It is worth the effort to catch this nationally touring show before it closes on January 12. 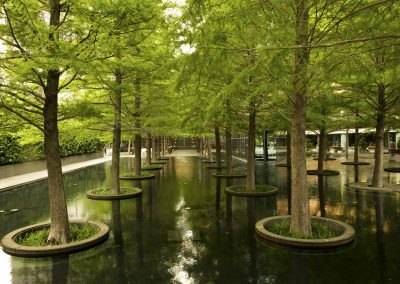 Landscape architect Dan Kiley (1912-2004) earned acclaim as a leading Modernist and the sole “classicist” of that movement. 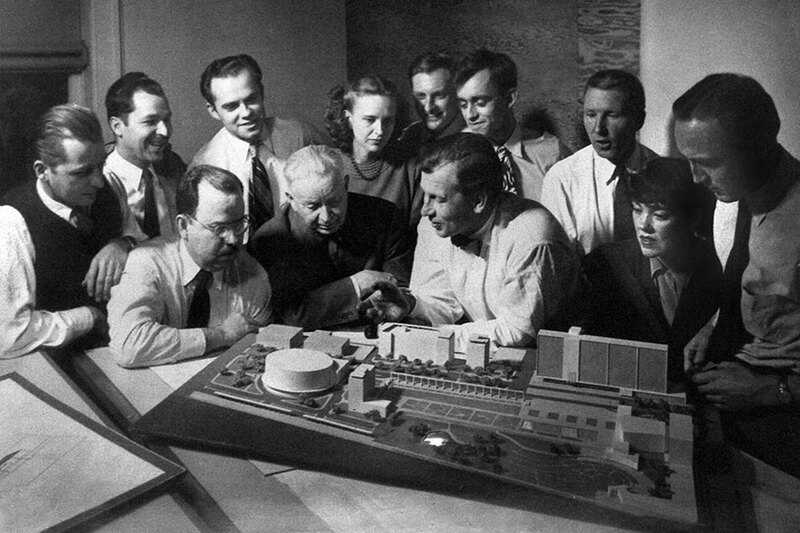 While studying landscape architecture at Harvard, Kiley co-authored with fellow students Garrett Eckbo and James Rose three game-changing “Design Manifesto” articles published in The Architectural Record in 1939 and 1940. 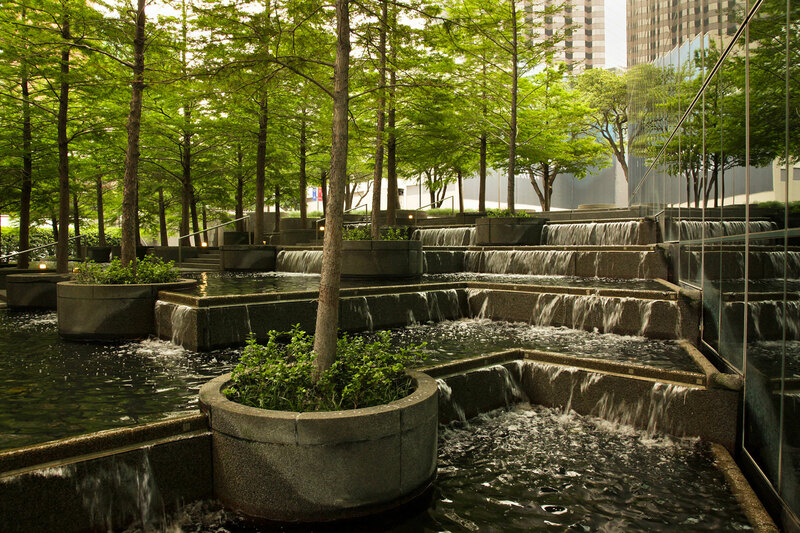 They called for a shift toward “cities redesigned for living” and for well-balanced “recreational systems, among other philosophical proposals.” Kiley remained thoughtful about design, even meditative, seeking solutions that were elegant, functional and uplifting. One book about his work is subtitled “The Poetry of Space.” He said he worshipped nature, and viewed humans as part of that natural world. 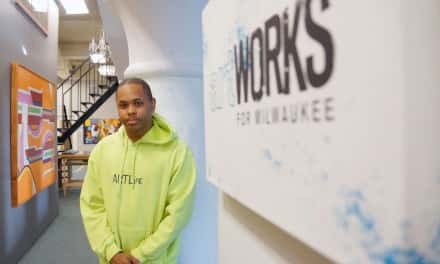 Kiley was also prolific, completing more than 1000 commissions, including two local spaces: at the Milwaukee Art Museum and the Marcus Center for the Performing Arts. He worked with many renowned architects, including Louis Kahn, Richard Meier, I.M. Pei, and Kevin Roche, Eero Saarinen and Henry Weese, the Marcus Center’s architect. 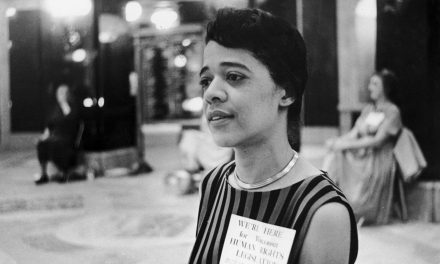 Harry Wolf spoke of Kiley’s prodigious talent and the “presence of his spirit” as a “special elixir” in collaborations. Nonetheless, the 100th anniversary of his birth passed in 2012 without any fanfare – despite his living until age 91 and practicing until shortly before his death. 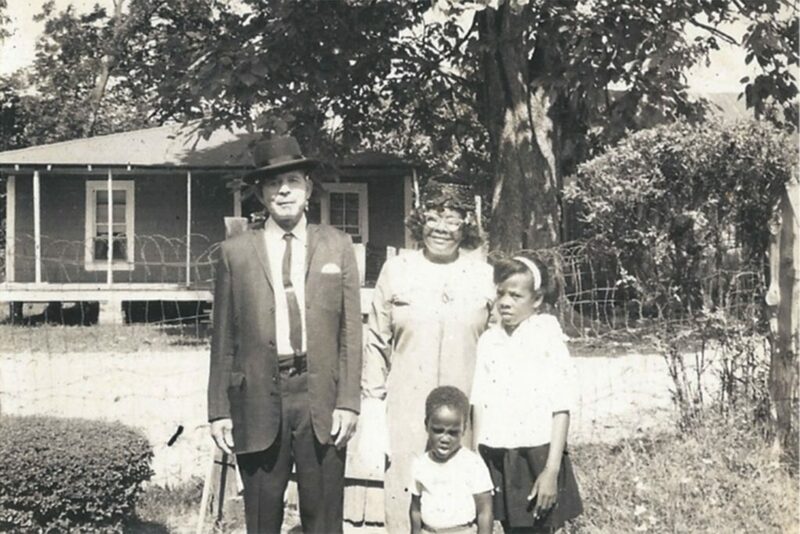 That collective forgetting inspired The Cultural Landscape Foundation (TCLF) in Washington, D.C. to track down Kiley’s extant works and create a photographic exhibition highlighting several dozen of them. Some public sites depicted in 30 photographs may be familiar. 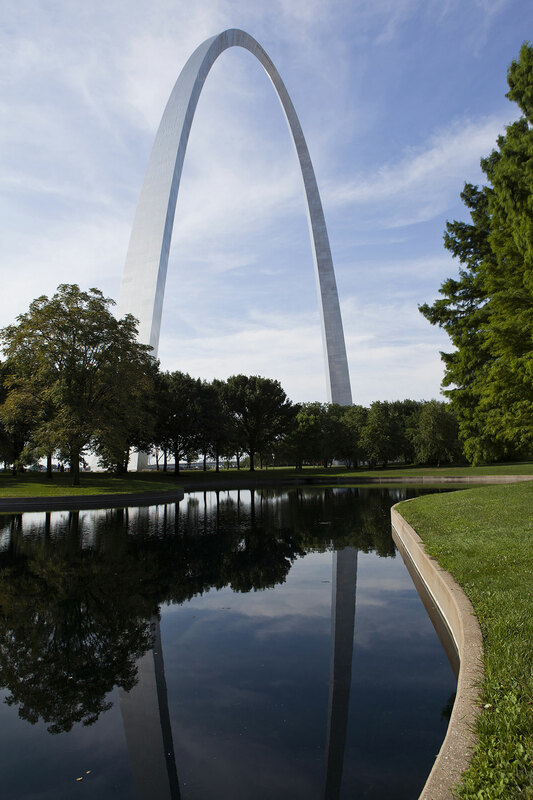 Featured nationally prominent projects include the grounds of the Jefferson National Expansion Memorial (“The Arch”) in St. Louis; the John F. Kennedy Presidential Library in Boston; and the Art Institute of Chicago’s South Garden. 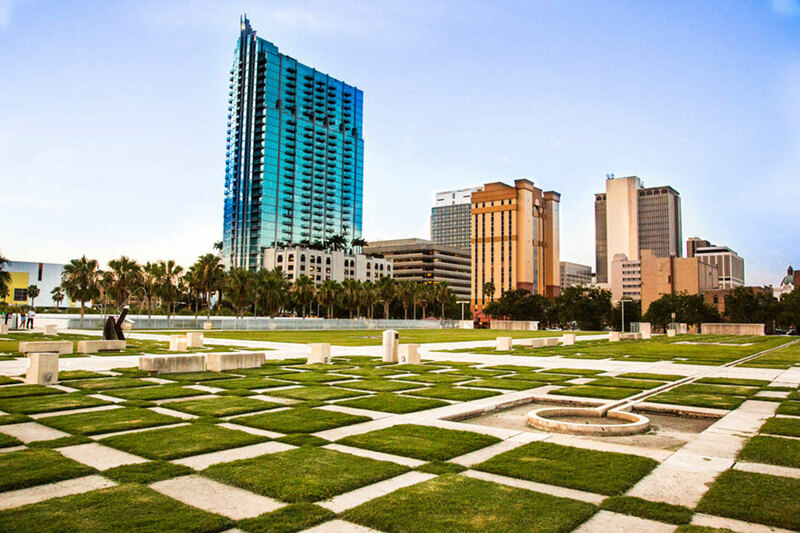 Other sites in the show include the L’Esplanade General de Gaulle in Paris; Kiley Park in downtown Tampa, and landscapes around the Dallas Museum of Art and the Oakland Museum of California. Private gardens round out the exhibition, including images of the Kiley family’s “East Farm” in Charlotte Vermont, where he and his wife Anne lived and worked for many decades, and raised their eight children. 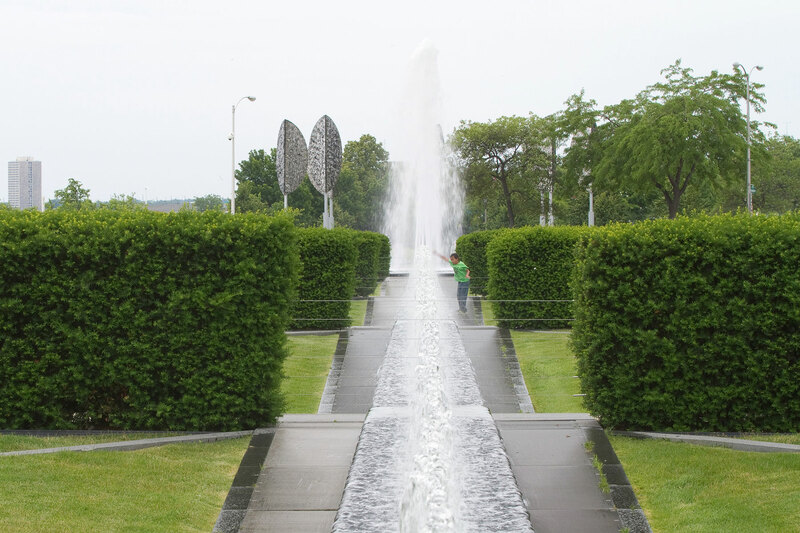 There’s also a dramatic image of Milwaukee Art Museum’s Cudahy Gardens. 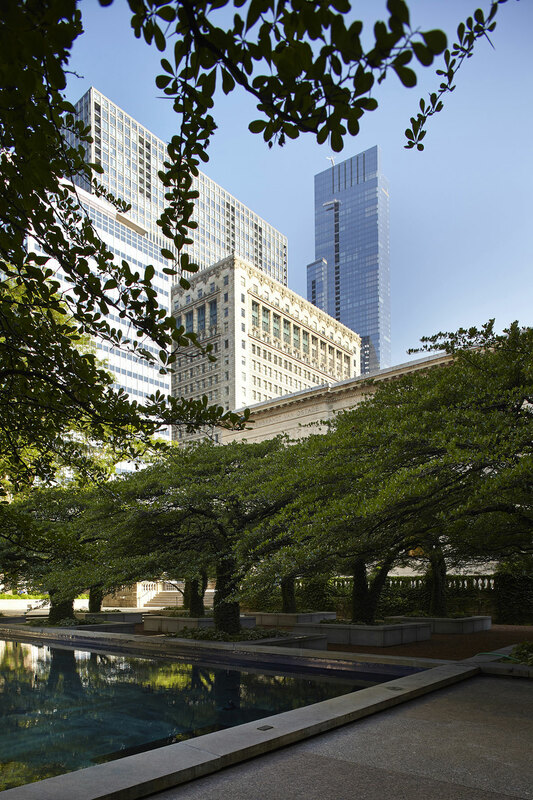 Tom Bamberger’s photograph depicts a child frolicking within the water channel at the center of a 600-foot-long, horizontal garden in front of the Quadracci Pavilion. Architect Santiago Calatrava and Kiley collaborated closely on the project starting in 1998. The landscape design is intentionally subtle and provides “a harmonic contrapuntal gesture in relation to Calatrava’s magnificent addition,” as Kiley wrote in a 1999 book about his work. Kiley also designed other spaces surrounding the addition: allees and groves and a new sea wall and multimodal path along the lake. 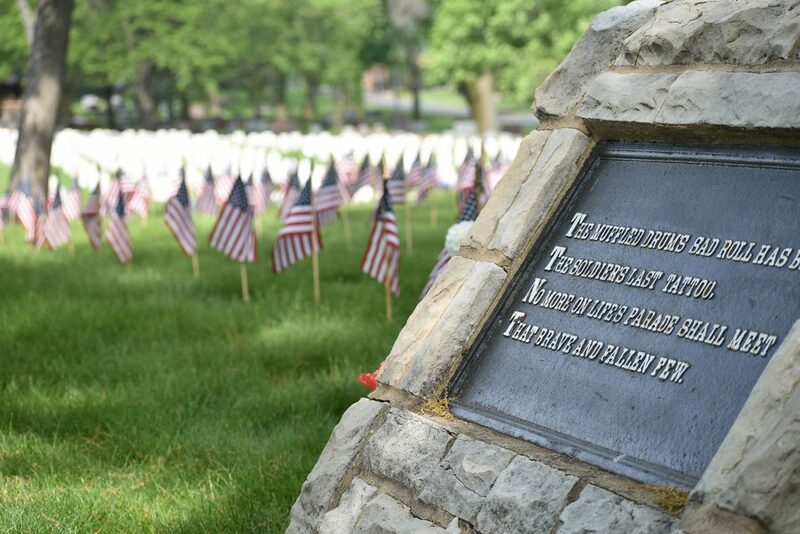 Milwaukee landscape architect Pat Kressin, the local project coordinator, credits Kiley’s visionary site planning for spurring subsequent lakefront projects, which ultimately linked Veterans Park and beyond with Summerfest’s grounds and the Hank Aaron Trail. When the museum-addition project was commissioned, Kiley was arguably more well-known in America than Spanish architect Santiago Calatrava. Despite Kiley’s renown, Bamberger and others have noted that these gardens are not always maintained in a manner befitting an important artistic legacy. Other Milwaukee places designed by renowned landscape architects, including Frederick Law Olmsted and Warren Manning, have likewise been neglected and even carved up with little debate about their merits. 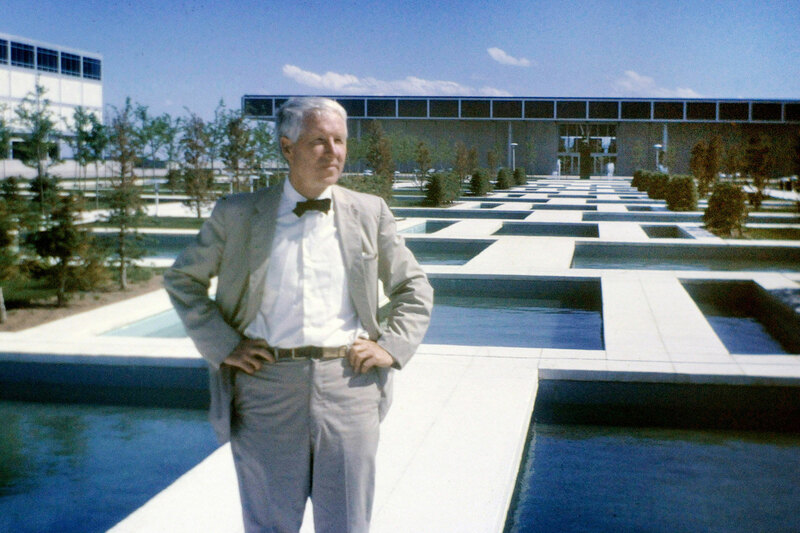 Kiley is known for several collaborations with architect Eero Saarinen, who designed Milwaukee’sWar Memorial that houses original portions of MAM. Saarinen designed St. Louis’s iconic “Arch” and the two also worked together on the 1955 “Miller House and Garden,” a private property in Columbus, Indiana. Named a National Historic Landmark, the project took a ground-breaking approach to interrelating a home and its landscape. 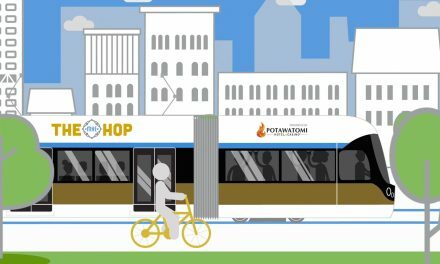 It’s now stewarded by the Indianapolis Museum of Art, which offers public tours. The exhibition reveals key Kiley design elements and motifs. 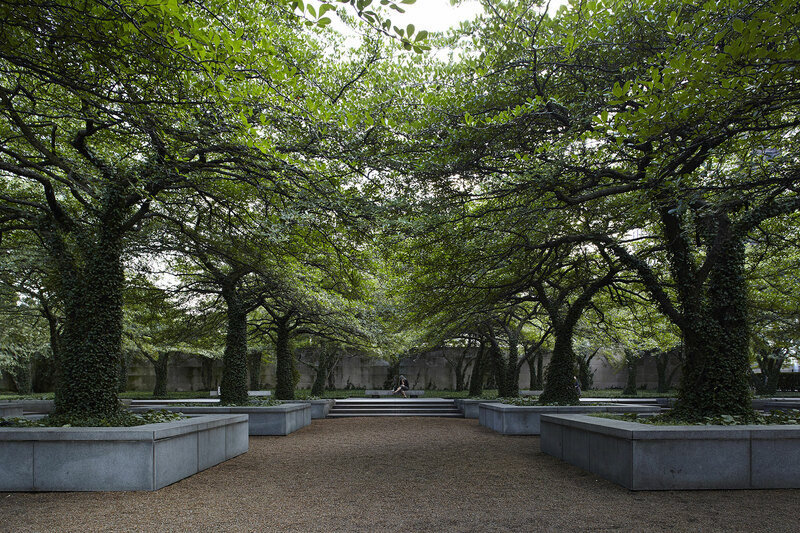 One hallmark is the use of grids, symmetry and other linear structure, as means to “organize nature.” There are plentiful trees in virtually every image; some cast intriguing shadow patterns, including those in massive planters in the Chicago’s South Garden. 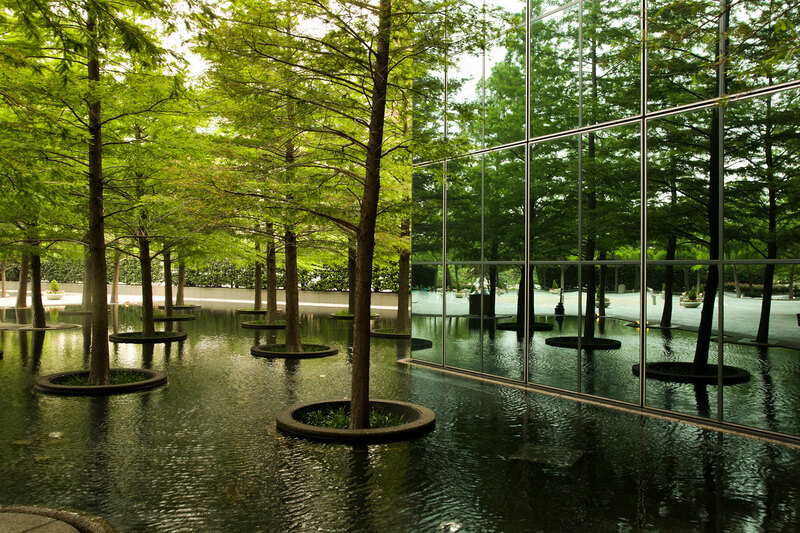 Water is apparent in 18 images, in the form of fountains, lakes and ponds. Fountain Place in Dallas, Texas, features rows of trees growing in concrete containers within a shallow lake around a plaza–all reflected in a glass-walled structure. 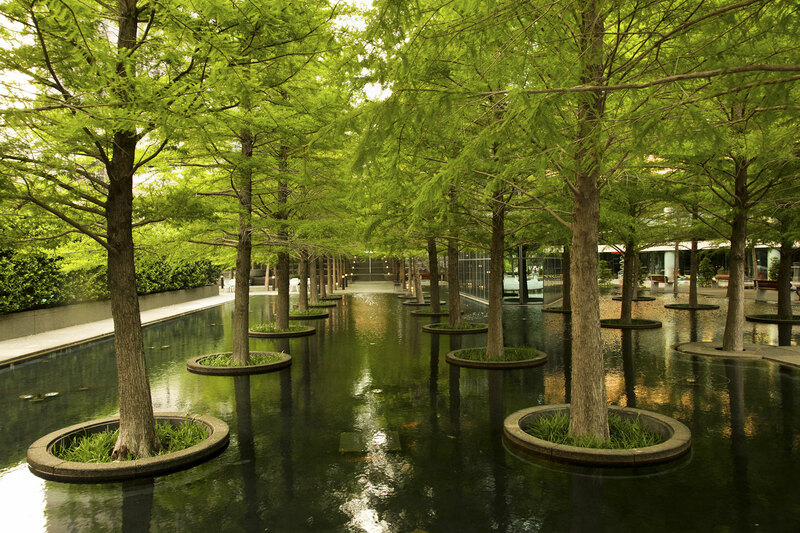 Several sites have more “naturalistic” elements: randomly planted trees, large ponds, and a subtle amphitheater leading to a small organic-shaped pool-pond within a residential garden. Photographs can only hint at the direct experience of any place. It seems this exhibition is likely to instill the desire to visit these legacy landscapes, especially public ones. Quotes about the development of each site, or its impact, are included, along with thumbnails of each site design. TCLF also provides detailed information about each project on its website, allowing interested viewers to dig deeper into the Kiley’s creative process and philosophy. 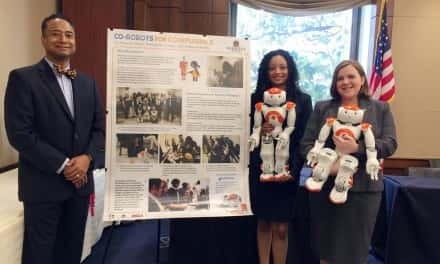 SARUP also hosted a symposium about Kiley in November when the exhibition opened, with speakers hailing from coast to coast, including Kiley’s longtime partner Peter Ker Walker. One quote, by Walker, notes that Kiley’s “work demonstrates how place informs life and how life in turn gives meaning and value to place. That he has done with art, grace and good humor to the lasting benefit to all.” Perhaps this exhibition will also enhance appreciation for Kiley’s local legacies and help ensure their preservation. To Visit: The Kiley Exhibition continues until January 12 in UWM SARUP’s gallery (UAP 126), at 2131 E. Hartford in Milwaukee. The exhibition is free and open Monday through Friday, 7:00 a.m. to 3:00 p.m., and by appointment or special request, unless otherwise noted. Virginia Small has written for publications throughout the United States, was a senior editor for a national magazine, and wrote a book on great gardens. Having grown up near Whitnall Park, she appreciated Milwaukee County’s well-designed system of parks and its Olmsted legacies.